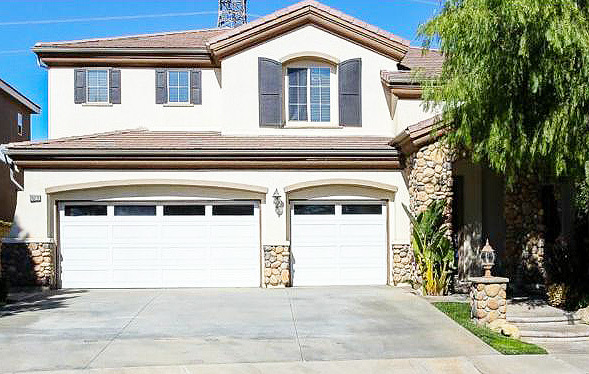 WELCOME HOME TO THIS RARE VALENCIA VIEW HOME AT THE END OF A CUL-DE-SAC!! Terrific home with open entry, formal living room & dining room with high ceilings! Family room with fireplace. Features include carpet and tile flooring, custom paint, Full bedroom & bathroom downstairs! Open kitchen with granite counters & backsplash and center island! Master bath with dual vanities, separate bath tub with awesome view & big walk-in closet! Backyard offers custom stamped concrete patio with patio cover, built in BBQ and awesome views! This Valencia CA home for sale at 24211 English Rose Pl, Valencia CA is located in the Promontory tract in Copperstone off Copperhill Drive. The home features lovely granite counter tops and tile floors as well as a back patio and built in BBQ area. It also has a view from the back yard and is located toward the end of a cul de sac. The home was built in 2000 and is a standard sale. There is an association pool and spa. HOA fee is $36 per month. Great schools.